Catani Gardens from Nolan’s St Kilda series was produced during the early–mid 1940s. The painting was created by Nolan only weeks after Under the pier and in it he depicts eight couples seeking romance and serenity in this garden by the sea. 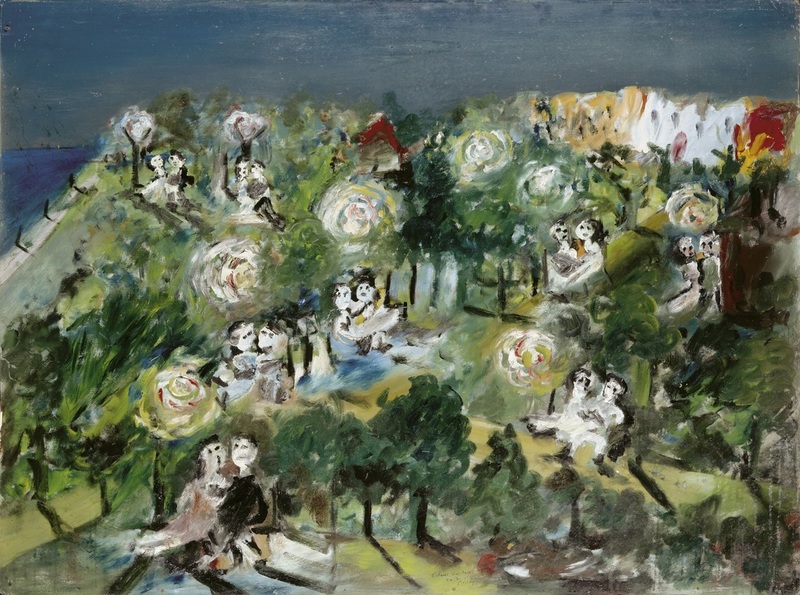 Catani Gardens conveys a naïve, almost child-like quality, accentuated by the abstracted figures and the loose, swirling brushstrokes which are reminiscent of Vincent Van Gogh’s Starry night. Nolan was a prolific painter and, working rapidly, he consciously sought to evoke a fresh, unconstrained, child-like simplicity in his work. Although Nolan’s work does not neatly conform to any particular artistic style or tradition, he was most interested in the ideas and techniques of primitivism and Surrealism and he was particularly influenced by the French nineteenth century primitif painter, Henri Rousseau and by the paintings of Danila Vassilieff, a Russian-born émigré artist who played an important role in the development of figurative expressionism in Australian art.